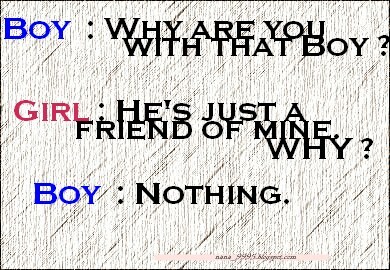 .GIRLS always says that GUYS are cruel . you Hurt GUYS too ? and also Useless and Brainless too? They hurt else and another. Because boys doesn't fight about that. for them it's only a SMALL CASE. It's easy to know a GUY get jealous. World war 3 is about to start ? 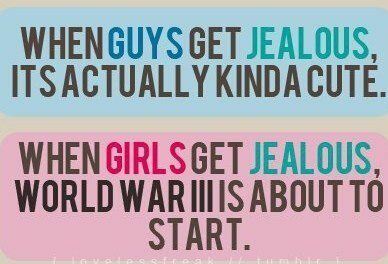 Girls just get Jealous EASILY ! Just when She saw Her BOY with another girl. their friends like to use words to comfort their friends brokenhearted friends. 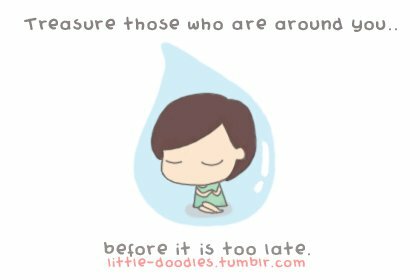 It will be eventually get hurts. "He might loss his phone"
"His phone don't have anymore credits"
All are just AN EXCUSE you GIRLS made. It will be hurt anyway..
Guys go thru problem just like THAT! That's whats life really is. Putting every Stupid, Hurtful, and sad things in your head for what Reason ?? Getting yourself older with more white hairs ? Unless you want to join cosplay.. Framed Him ? You will regret ..
why should you framed him ? Did he ever done anything wrong to you? You are just an ordinary student that goes to school everyday. Who cares who are you..
Am I Begging Food From you ? I'm not trying to be rude to you. You make people HATES you with no reason. I dislike you with a reason. AND MORE LIKE A BBB #@*&?! . with all you B*tchy Friends. Did I done anything wrong ? and one of you got JEALOUS? Do you know what FRIENDS really means? Your face only shows DARKNESS.. 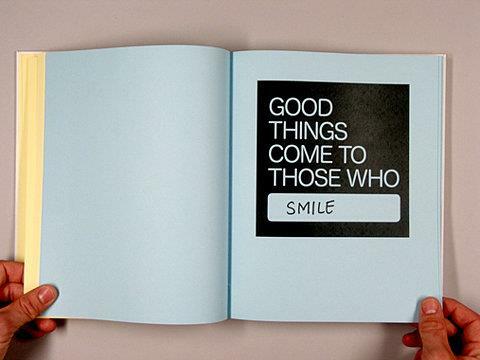 Smile and change everything ! You'll be like the witch. And you'll get older then your own age. No wonder you look so old. Look to the bright sight ! you will regret what you have done ..
You may think of things. like some Stupid things you did in the pass. How you treat your friends in the pass. and regret doing it now. and say " WHAT A STUPID FOOL "
" Whats Comes Around Goes Around LOSER "
But I'm not those kind of person. You may Think that I should hate you. I Do hate you at first. I should Thank you in way. I found my REAL TRUE friends. So I doesn't blame you. Now you will Slowly find. I'm Still the friend of yours. you can just add me back. They will think that you're smart. But if they don't ? Stay Moody Or Stay Happy ? So why should you ? With a Laugh ? With a Joke? giving other people a Fake smile ? No one force you to smile. If you're thinking to be moody. Why Can't you act like yourself like you always do? After your heart broken you're still human. Giving up on everything ? What you can do for you own life ? You should get a LIFE MAN ! It means my life is obviously more interesting than Theirs. You are the Director of your Life.